Disruptive innovation is coming to the construction industry, whether we like it or not. What this disruption will look like, and what can be done to prepare for it, is up for debate. Disruption is a good thing for the construction industry, but not always convenient for the established players in the field. With the industry’s infamous lack of productivity, the field is ripe for harvest from smaller innovators. Disruptive innovation is a market force that seemingly comes out of nowhere and shocks the slow-moving titans of a particular industry into either a defensive pivot or a complete collapse. A recent FMI article nicely summarized famous cases of past disruption, one of which was the spectacular rise of Netflix that caused the collapse of video rental giant, Blockbuster. The basis for this disruption was Netflix’s business model that emphasized convenience, home delivery of DVDs, and low cost, unlimited monthly rentals. Blockbuster made a strategic error by halfheartedly attempting to duplicate Netflix’s home delivery model right as Netflix leapfrogged over them into its streaming service, virtually ending the video rental industry 5as we knew it. This example of disruptive innovation, moving a service from brick and mortar stores onto the internet, is typical of the technological advancements of the time. In this context, what would disruption look like in the construction industry? The industry is literally brick and mortar and cannot be transferred to the internet. A market disruption, however, is usually something that no one sees coming. Blockbuster may have felt threatened, but they clearly didn’t believe that the whole industry would fall out from under them so quickly. It’s easy for us to judge their miscalculation in hindsight, but in reality the technology changed too quickly for them to adapt it to such a large organization. Construction can't be moved online, but what are some new technologies that could disrupt the industry? My robot, my friend... my co-worker? While it may seem like science fiction, construction could be disrupted by the rise of robot labor. A recent NY Times article profiling a bricklaying competition that included a robotic SAM (semi-automatic mason) in the background, showed the potential for market disruption. Though the robot didn’t win the competition, it made an impression. The conclusion, in short, was that robots still can’t compete with humans—robots can’t do corners, for example—but they could help to reduce the pressure of labor shortages. Because bricklaying takes years to master, a robot co-worker could reduce labor pressure by doing less complicated tasks, thereby allowing firms to work faster. At the moment, the SAM is still prohibitively expensive for most firms, but as this technology advances and costs go down, the strategy of augmenting labor, not necessarily replacing it, can give some firms a distinct advantage over others. How 3D printing could change the construction industry has been an open question for some time now. So far, it hasn’t fulfilled the lofty predictions of revolutionizing construction. Construction is an industry that often focuses on traditional methods, and as a result, has been conservative in its approach to 3D printing. However, according to new studies, some firms are beginning to adopt the new technology as it improves and its costs become lowered. It’s being targeted to situations in which special shapes required for specific projects can be manufactured quickly. Just as with the SAM, it is being used as a supplement rather than as a replacement for traditional methods. Many people dismiss this kind of technology because it’s not exactly ready for prime time, but it’s just that kind of dismissal that allows disruption to thrive. How can a firm ensure its survival in a time of disruption? For starters, never take things for granted. If Blockbuster is any example, today you could be the biggest player in the game, but tomorrow you could be out of business. Pay attention to what’s going on with new technology and think creatively about how to develop a new business plan around it before external factors make it impossible. If you’re a smaller organization, think about what you can do to provide a new service that takes advantage of the unserved markets left by larger, slower-moving companies. Another form of self-preservation is being lean. Some firms can take advantage of known gaps in productivity by using Lean methodology designed to minimize waste of materials, time and work. These lean firms are better able to adopt and adapt new technology, and can bring down the cost for consumers and increase profits for the company. Another way to innovate is to develop a data strategy. We’ve talked about this in a previous article but it should be mentioned again since it has a direct effect on productivity. 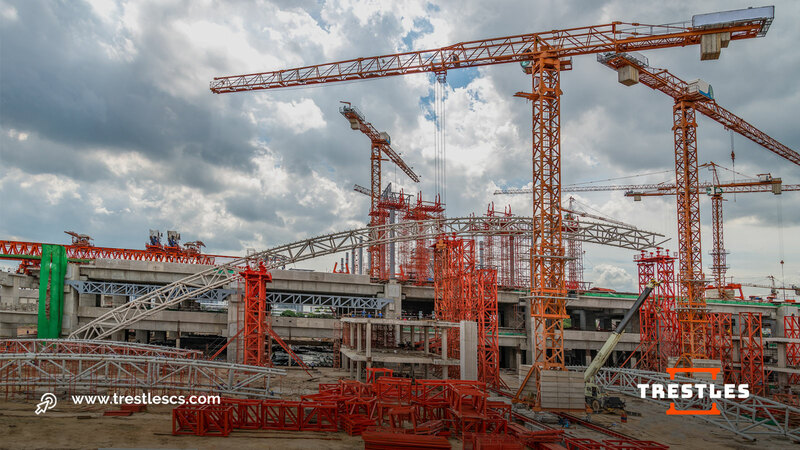 To summarize, construction as a complex system with many moving parts produces a lot of data that, when analyzed properly, can help inform where to focus efforts for increasing productivity. This is a necessary first step to help your company understand where you can create your competitive advantages. Staying ahead of disruptive innovation is difficult. If everyone can see something coming down the road, then it wouldn’t be disruptive. Right now, new forms of technology are living at the edges of construction, but it’s important to be aware of what’s happening and not dismiss innovation. Like Blockbuster, you may regret it. As you aim to stay ahead of disruptive innovation, maximizing productivity and efficiency can help you prepare for the unexpected. 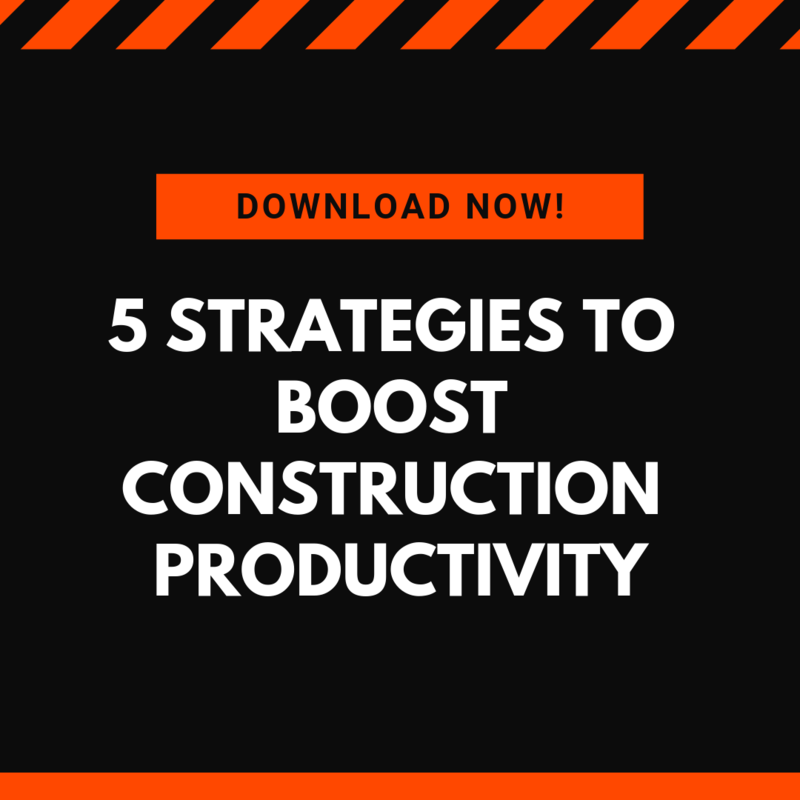 Check out our free infographic, 5 Strategies to Boost Construction Labor Productivity.